When it comes to food, Delhi is famous for its chole-bhatura. Walk around the city and you will find restaurants selling hot fluffy bhaturas with spicy mouth-watering chole to excited customers. 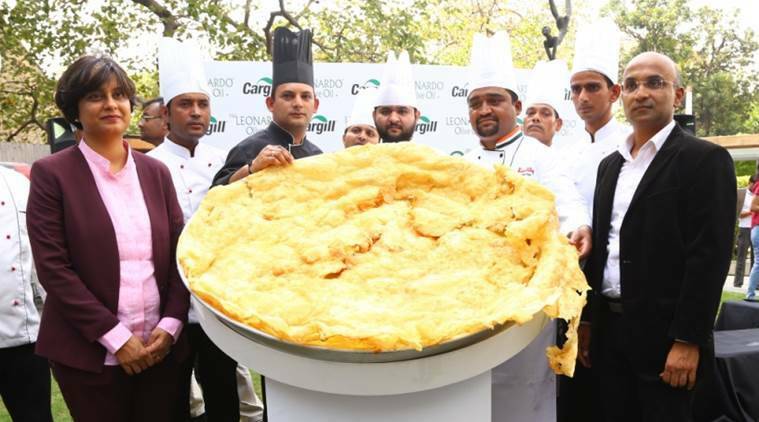 What if we tell you that in a bizarre turn of events, Leonardo Olive Oil created a Limca Book of Records by cooking India’s largest bhatura at an event hosted in the capital? The bhatura which was prepared measured 4 feet 2 inches in diametre. This is an effort to shatter the mindset that bhaturas which are symbolic to indulgence aren’t as unhealthy as it’s thought so. As per the study conducted by National Accreditation Board for Testing and Calibration Laboratories, bhatura cooked in Leonardo Olive Pomace Oil absorbs 42% less oil as compared to regular refined oil and also boosts good cholesterol, helps in weight and waist-line management, controls blood sugar levels, and is trans-fat free. During this event, a recipe book with Indian breakfast, lunch and dinner recipes was also launched.